Disneyland is making a major change to its popular annual pass program in preparation for the highly anticipated opening of Star Wars Land. We’ve been wondering what steps, if any, Disney would be taking to deal with the extreme attendance levels expected next summer, and today we got an answer: park-specific blockouts! So, what does this mean? 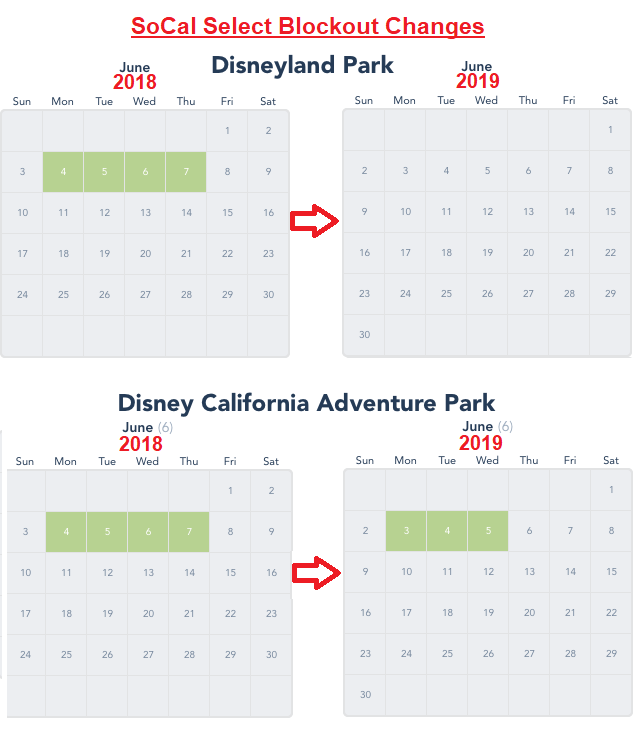 Essentially, annual passes now have two blockout date calendars: one for Disneyland and one for Disney California Adventure. Depending on the AP tier level, passes can now be blocked out at one park and valid at the other. 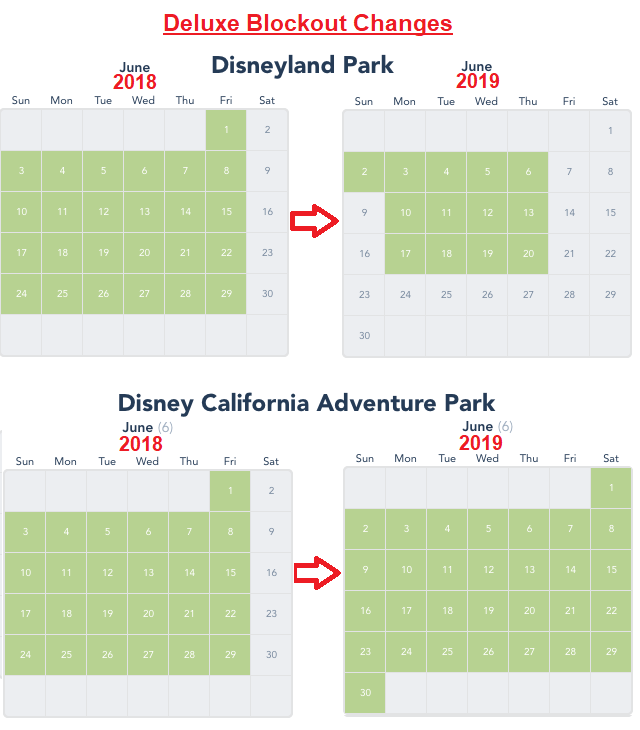 The blockout date changes take effect in June 2019, coinciding with the opening of Star Wars: Galaxy’s Edge at Disneyland next summer. Star Wars Land is expected to draw huge crowds at Disneyland next summer. Some Disneyland passholders will see more limits than others starting next year. Let’s take a look at what these changes mean for the annual pass tiers. Starting in June 2019, SoCal Select passes will no longer be valid on the first week of the month at Disneyland. The pass will still be valid at DCA, minus one day next year. Being the lowest and most popular tier level, we’re expecting more changes to the SoCal Select blockout calendar for the rest of the year. The pass will most likely be limited to DCA only during busy seasons and holidays after Star Wars opens at Disneyland. Deluxe passholders will see bigger changes next year. Instead of being valid at Disneyland everyday in June except for Saturdays, the Deluxe pass will now be blocked out on all Fridays, Saturdays, and Sundays (except the first Sunday). The pass will also be blocked out at Disneyland for entire last week of the month, and the blockouts will most likely extend into July and August. We’ll know for sure once those months get released, but it’s a significant change since the pass may no longer be valid at Disneyland for most of the summer season. On the plus side, the Deluxe pass will now be valid at DCA everyday in June, including Saturdays, another sign that the pass will be DCA-only during the summer. The legacy Southern California Pass is no longer available for sale, but also sees major changes next year. The pass will no longer be valid at Disneyland in all of June, while the DCA blockout calendar remains largely unchanged. 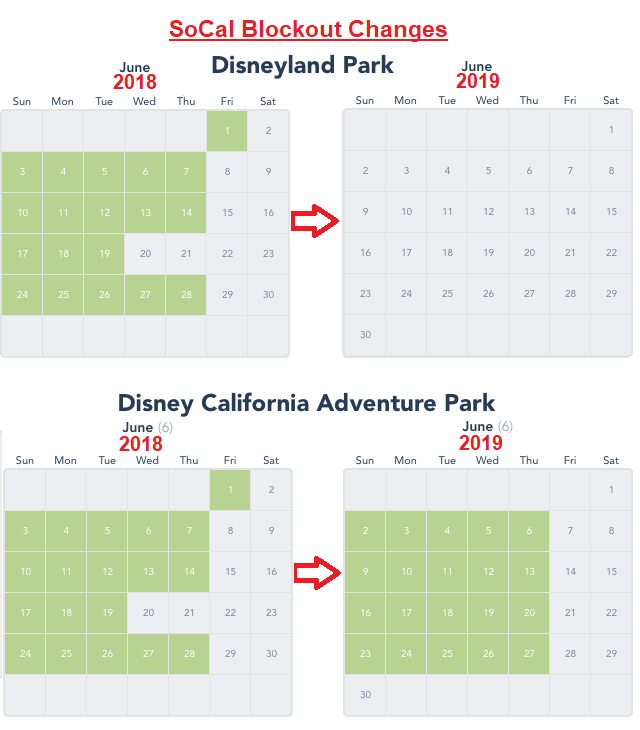 There are no changes right now to the Signature and Signature Plus annual pass blockout calendars for June 2019. Both pases will still be valid at both parks for all of June. Signature Plus passes are valid everyday of the year, so we don’t expect any changes there. The Signature pass is valid everyday except for around Christmas (the busiest time of the year), so we’ll be keeping an eye out for any changes. Be prepared for capacity crowds at Disneyland next summer. 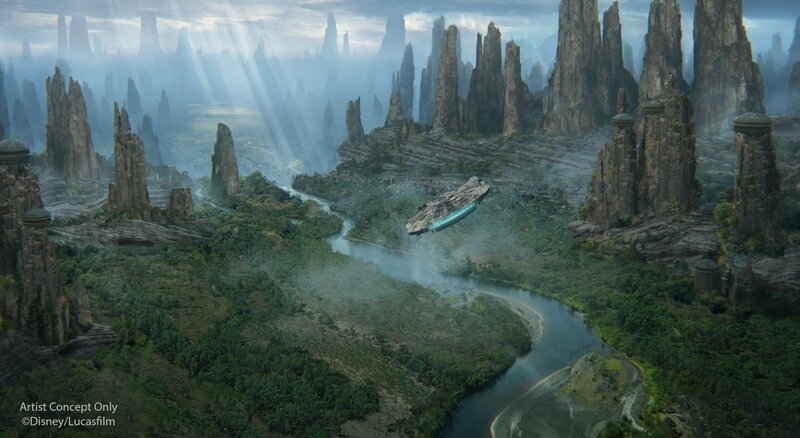 Star Wars: Galaxy’s Edge opens at Disneyland in Summer 2019, and it’s no secret that it’s projected to draw massive crowds. The park is crowded more often than not these days, especially with a large number of annual passholders. We’re expecting capacity attendance once the new land opens, so while the new AP blockouts may ease some of the gridlock, plan on Disneyland to be a very crowded place next summer. Be sure to check out the Disneyland Crowd Calendar for the best and worst days to go. What do you think of these changes to the annual pass program? Do you think it will make Disneyland less crowded at all? Be sure to let us know in the comments below! Wow, it is going to be crazy crowded next summer! The Deluxe pass is no longer worth it. They are going to blockout Disneyland in the summer. Let me guess, they aren’t going to lower the prices of the APs, right? If your pass is no longer valid at Disneyland on certain days, they should lower the price. This is going to make DCA more crowded because all the APers will be forced to go there instead too! Signature Pass is the only way to go! Wow! They have completely killed the value of getting an annual pass. Why don’t they just get rid of the monthly payment plans if it’s so crowded? ?